PARIS, Feb. 17, 2014 – Boeing [NYSE: BA] and Air France Industries KLM Engineering & Maintenance (AFI KLM E&M) have successfully completed the Mid-Life Upgrade modification on the first of four E-3F Airborne Warning and Control System (AWACS) aircraft for the French Air Force. The upgrade is part of a Foreign Military Sale in 2010 between France’s Direction Générale de l'Armement (DGA) and the U.S. government. The first aircraft modified under the program is given a water cannon salute at Le Bourget Airport in France Jan. 31 prior to departing for testing. 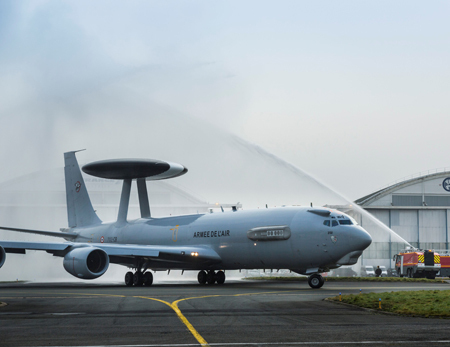 PARIS, Feb. 17, 2014 – Boeing [NYSE: BA] and Air France Industries KLM Engineering & Maintenance (AFI KLM E&M) have successfully completed the Mid-Life Upgrade modification on the first of four E-3F Airborne Warning and Control System (AWACS) aircraft for the French Air Force. The upgrade is part of a Foreign Military Sale in 2010 between France’s Direction Générale de l'Armement (DGA) and the U.S. government. "The success of this upgrade rests in the outstanding cooperation between Boeing and Air France Industries," said Yves Galland, president of Boeing France "We are looking forward to continue this successful partnership to meet the French Air Force's military needs." In June 2013, Boeing subcontractor AFI KLM E&M began upgrading the electrical, mechanical and structural systems and mission hardware on this aircraft. The Mid Life Upgrade – the largest ever for French AWACS – will provide the fleet a robust picture of the battlespace and more actionable information while reducing aircrew workload. "The Mid-Life Upgrade capability of this airborne surveillance, command and control platform is unrivaled," said Steve Swanz, Boeing's French AWACS program manager. "The excellent relationship of the French Government, U.S. government, and Boeing French AWACS teams has enabled completion of this modification milestone and the outstanding performance by AFI KLM E&M and our Boeing in-country team exemplifies our commitment to excellence in product and relationships." The aircraft now will undergo ground and flight tests at Avord Air Base before being delivered to the Air Force later this year once qualified by DGA. The Mid-Life Upgrade is the most important to date for the French fleet and is modeled on the Block 40/45 contract developed for the U.S. AWACS fleet. While the first AWACS aircraft was housed at the AFI KLM E&M site at Le Bourget Airport near Paris, the three other AWACS aircraft will be upgraded in a new facility owned by AFI KLM E&M at Charles De Gaulle Airport in Paris. A dedicated Boeing team will continue to provide on-site leadership, engineering, quality assurance support, hardware and software while working together with the Air France Industries modification team. "At the sides of Boeing, the Air France Industries teams are fully focused on the success of this major upgrade of the French AWACS," said Anne Brachet, EVP Air France Industries. "After successfully delivering this first modification in Le Bourget, we'll perform the following ones in a dedicated facility in Paris CDG. Investing in new infrastructures for this fleet clearly reflects our will to meet the French Air Force expectations and deserve its trust."